Daredevils Vitaliy Raskalov and Vadim Makhorov, whose unprotected skyscraper-scaling photographs would give any acrophobic person an immediate heart attack, are apparently not welcome in Korea. 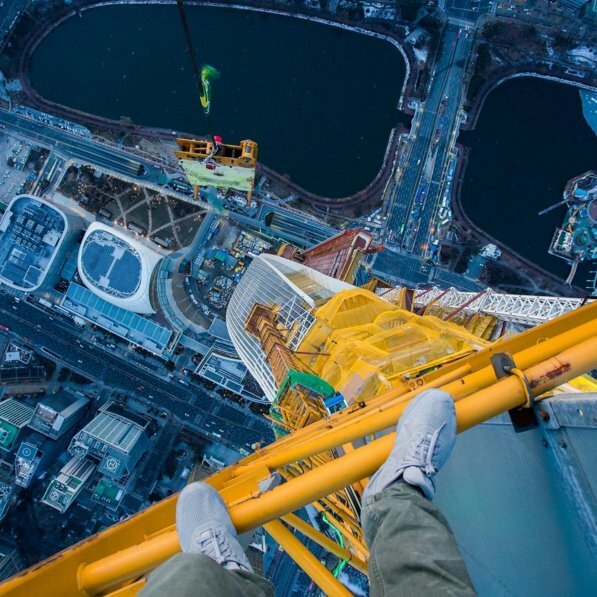 After the 20-year-old Raskalov updated his Instagram account with a photo of his feet precariously atop Seoul’s Lotte World Tower, Sunday, the Korean public responded with fierce criticism of his “reckless” and “irresponsible” behavior. In the shot captioned “Get ready for the new video. Seoul, Lotte World tower, 610 meters tall,” Raskalov wore regular sneakers standing on a protruding crane bar. Lotte World Tower is still under construction to reach its planned height of 555 meters. Once completed, it will stand at 123 levels as South Korea’s tallest building. Users left lengthy tirades under Raskalov’s photo in Korean, admonishing the adventurer for what they saw as unwarranted entry into private property, which could have resulted in disastrous accidents. One Korean user with Instagram handle “heuum_” called Raskalov “an unarmed IS soldier” in the sense that he poses a threat to the safety of innocent people around him. “He’s being a nuisance in a foreign country. Safety is the utmost principle at a construction site. He is thoughtless to be doing this without safety measures,” heuum_ said. Another user with the handle “chungcollin” argued that Raskalov, in his pursuit for thrill, risked everyone -- the security personnel, those in charge of the construction, the South Korean police agency and emergency staff. “I hope you realize your interest might be harmful for others,” chungcollin said. The two are anticipated to soon release the newly made videos of their trip up the Lotte World Tower, which will reveal how they managed to get past security.